» home » enterprise zones » » press-data collection reveals surprise: "we were too lean"
Press-Data Collection Reveals Surprise: "We Were too Lean"
For more than 35 years the company has been designing and building dies, and manufacturing stamped parts for the automotive, appliance, aerospace and medical industries. In addition to contract manufacturing, Waukesha manufactures the Sta-Collar annular flange for automotive stabilizer-bar applications. Press controllers at Waukesha Tool & Stamping, Sussex, WI, provide timing signals to presses and ancillary equipment as well as monitor tonnage and die-protection and in-die-measurement sensors. The controllers, networked via Ethernet, provide data to collection software to monitor pressroom productivity. 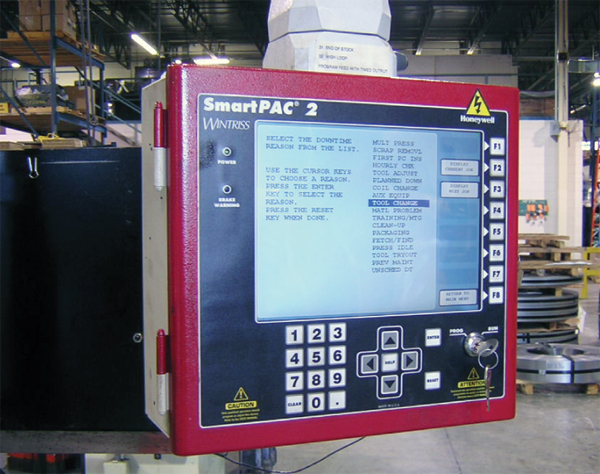 To optimize production, Waukesha equipped its eight primary presses with SmartPAC 2 controllers from the Wintriss Controls Group of Honeywell, Acton, MA. The controllers provide timing signals to the presses and ancillary equipment as well as monitor tonnage and die-protection and in-die-measurement sensors. Each controller has a built-in Ethernet port for simple networking without the need to run special serial cables. Waukesha implements lean practices throughout the organization. In order to get the timely, accurate and unbiased data required to track ongoing productivity enhancements and identify areas and processes that needed the most improvement, the company decided to implement an automatic shop-floor data-collection system. “Our expectation was to capture data from the presses, measure utilization, and assess our lean initiative,” says Jeff Clark, Waukesha Tool & Stamping president. The heart of the data-collection system is Honeywell LETS (Line Efficiency Track Software), which collects critical production information directly from the SmartPAC machine controllers and sends it over the existing inhouse Ethernet to the LETS database. The information then is available in report form, or can be accessed using Factory Viewer, a built-in browser-based real-time interface. 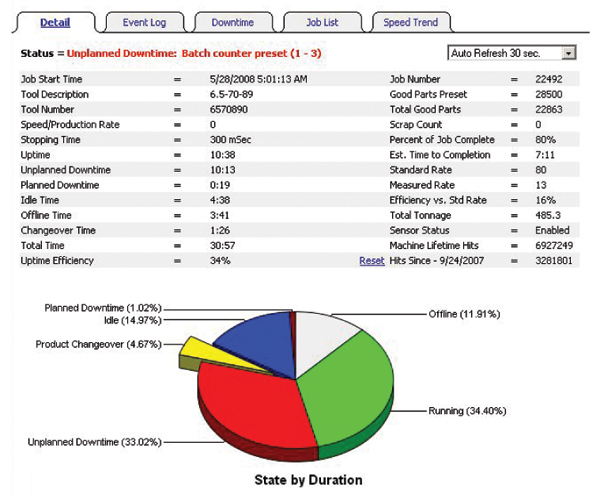 Software collects critical production information directly from the press controllers and sends it to a database that can provide reports such as this one, which summarizes downtime reasons for a stamping job. with the Wintriss controls, LETS can collect data from production machines using a variety of methods. 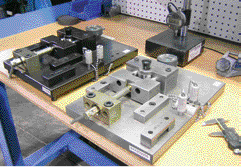 A machining center in the toolroom communicates via a LETS Machine Interface (LMI) terminal. The LMI collects cycle counts and its touchscreen allows the operator to select downtime reasons. Waukesha also runs a non-Wintriss-equipped stamping line owned by one of its customers, using a simple network interface temporarily installed on the press to collect utilization information. The LETS software monitors the machines and accounts for 100 percent of time during the scheduled production day. It places this time into one of five categories: “Running” when the machine is operating and making parts; “Idle” when the machine is stopped for an unknown reason; “Changeover” while the machine is being set up for a new job; “Planned Down” when the machine is stopped for a scheduled break; and “Unplanned Down” when the machine is stopped for a known reason. Unplanned downtime is further categorized by reason. The data-collection software collects running and idle time automatically as it polls the controllers, and also automatically collects any unplanned downtime events initiated by the SmartPAC controllers. These events include tonnage and sensor faults. Other events such as changeover, planned downtime and many unplanned downtime reasons cannot be collected automatically and must be selected manually by the operator at the controller. These selections are made on a special Dialog menu. Experience has shown that simply providing a downtime-reason menu is not enough to ensure a complete and accurate account of downtime reasons. For example, if an operator were to restart a machine without selecting a downtime reason, the time would be logged as idle time. Since idle time provides no indication of why the machine was actually down, that selection needs to be minimized. The Wintriss controllers use a novel approach to minimize the amount of reported idle time. Whenever a machine stops for more than a preset grace period (usually 1 min. ), the controller automatically brings up the Dialog menu and prevents machine operation until an operator selects a downtime reason. When the operator selects the reason, the controller backfills the previous idle time with the real downtime cause. Armed with downtime data, Waukesha has taken steps to increase press utilization, including the placement of measurement gauges at presses to reduce first-piece-approval time. At Waukesha Tool and Stamping, press operators carefully created the Dialog menu, with the most frequently used reasons placed near the top of the menu. In this case, the most frequently used reasons: “Multi Press,” indicating that the operator was unavailable due to responsibilities at another press, followed by “First PC Ins,” meaning that the machine was stopped awaiting first-piece approval. That these were the leading causes for downtime did not surprise Clark and his team. What was surprising: Approximately one-third of the downtime occurring throughout the plant traced back to these two reasons. Like many manufacturers, Waukesha Tool and Stamping tries to do more with fewer people. In addition to running multiple presses, operators perform quality checks and assist in setup and troubleshooting, with quality-control personnel also stretched thin. Machines sat idle due to a lack of personnel available to perform simple tasks needed to keep them running. Waukesha has taken several steps to reduce downtime. By better understanding the needs of each machine, company management quickly modified each operator’s responsibilities to better balance the workload. And the addition of roving operators to certain shifts helped minimize instances where presses sat for extended periods of time with easily correctable problems. The roving operators clear sensor faults, perform coil changes and correct other short-term issues, allowing others to focus on setting up new jobs and troubleshooting more complex problems. Other downtime-reduction measures have little to do with personnel. For example, LETS showed that one high-volume machine stops an average of seven times per hour so that the operator can change the parts bin. These stoppages create 12 hr. of downtime per month, greatly lowering the machine’s efficiency and keeping the operator from addressing problems at other machines. Based on the cost of this downtime, Waukesha justified an automatic indexing system for the high-volume press, a system that automatically rotates an empty container into place based on a signal from the SmartPAC 2 controller. The operator can replace full containers with empties whenever he has the time, without stopping the press. First-piece-approval times have been shortened by deploying additional attribute and functional gauges at the presses. This allows operators to quickly perform quality checks, and reduces the burden on the quality-control department. The LETS software helps in other s. The LETS Factory Viewer includes a detailed event log that provides a time- and date-stamped account of every event at every machine. Gary Rutkowski, Waukesha’s inhouse sensor expert, uses the event log to monitor recently sensored dies for nuisance faults and other startup problems that might otherwise go undetected. Rutkowski now can ensure that the sensors are employed on all shifts, and have not been bypassed or disabled due to excessive errors or nuisance stops. Also, the software knows where and when every tool runs, and how many parts the tools make. Therefore, it can keep an accurate total-hits count for each die—even as the die runs in multiple presses—eliminating tedious and sometimes inaccurate manual recordkeeping. Tooling personnel at Waukesha use the dies’ total-hits counts for maintenance purposes, comparing tooling-related downtime from job to job, and optimizing the maintenance intervals for each die. The unplanned-downtime information not only identifies problem equipment, but also objectively quantifies the severity of problems to allow efficient prioritizing of corrective actions, essential for the small maintenance staff at Waukesha. Interested in HARD ROCK? How about Kiss band? The band is on a tour in 2019 all across the US&Canada. Visit https://kousaiclubsalon.jp/third-party/ to know more about KISS concert in 2019.